Details are still coming in, but a tragedy has been compounded by another tragedy in New York. President Trump recognized a woman whose daughter was killed by the brutal gang MS-13 during his State of the Union address. Evelyn Rodriguez was the mother of 16-year-old Kayla Cuevas who was found beaten and stabbed to death in September 2016. The brutal murder was attributed to MS-13. Friday at her daughter's memorial, Rodriguez was struck and killed by a car. It is unclear if the death of Rodriguez was accidental or if she was intentionally struck. It all started when the 16-year-old Cuevas was leaving school on Tuesday morning when she and her fellow backpack-toting teenagers walked past an old minivan parked near the school in the suburbs of central Long Island. As the teens walked by, members of the violent street gang MS-13 jumped out of the minivan armed with baseball bats and began beating the three teens. Investigators say the gang members thought the teens were members of a rival gang. The gang members then hopped back in the minivan with one of the teens and sped off in search of another victim. The police surrounded the neighborhood and eventually spotted the MS-13 members as they were trying to abduct a fourth victim. A Suffolk County indictment revealed the worlds of one of the gang members named Miguel Rivera, 20. "We were going to take him somewhere private and beat him to death," Rivera said according to the documents. A teens body was discovered Tuesday night on the side of Stahley Street and on Wednesday Cuevas's body was found. The second victim matches the description of Cuevas's missing friend who was allegedly killed while trying to prevent her from being abducted in the first attack. The family of the second victim, 15-year-old Nisa Mickens, said they believe the gang members were trying to abduct Cuevas when Mickens appeared to try to fight off the kidnappers leading to her death. Investigators arrested Rivera and four others in connection with the killings. All but one of the teenage gang members were students at Brentwood, according to Suffolk County police. One of the most disturbing revelations the investigation uncovered was that three of the accused gang members were unaccompanied minors who were caught entering the U.S. illegally. The three unaccompanied minors were then placed in the community by a federal refugee program. The last year has seen a strong focus by the Trump administration on cracking down on the violent street gang MS-13. President Trump told the story of Kayla Cuevas and Nisa Mickens during his January State of the Union address. "Many of these gang members took advantage of glaring loopholes in our laws to enter the country as unaccompanied alien minors and wound up in Kayla and Nisa’s high school," Trump said. 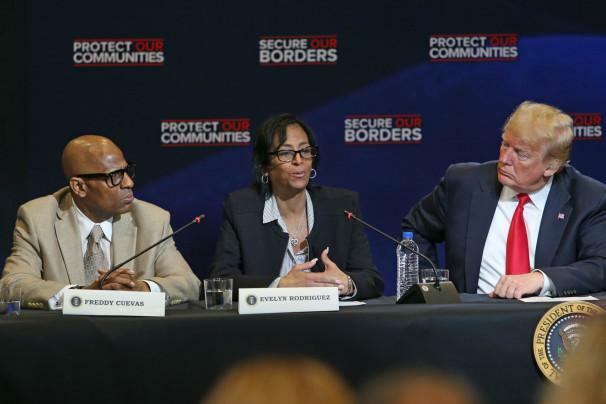 Kayla Cuevas's mother Evelyn Rodriguez filed a $110 million federal lawsuit claiming administrators failed to protect her daughter and allowed MS-13 to create an "environment filled with fear within the school." Another lawsuit, this one filed by the American Civil Liberties Union against the Trump administration says the school was too hasty to label kids as gang members leading to their wrongful imprisonment. Just who exactly is the ACLU trying to protect because I thought the keyword in their organization's name is "American". Police say Rodriguez was killed Friday in Brentwood just an hour before a planned memorial for her daughter Kayla Cuevas. Suffolk County police are investigating the death of Rodriguez but have not released any details so far. Rodriguez was expected to attend a candlelight vigil for her daughter when she was struck by a vehicle. She was then rushed to Southside Hospital in Bay Shore where she was pronounced dead. Long Island Congressman Pete King (R-N.Y.) wrote on Twitter, "Prayers for Evelyn Rodriguez the mother of MS-13 victim Kayla Cuevas. Evelyn was struck by a vehicle this afternoon at her daughter’s memorial." The President tweeted shortly after news of Rodriguez' death broke saying, "My thoughts and prayers are with Evelyn Rodriguez this evening, along with her family and friends. #RIPEvelyn." The problem of illegal immigration is becoming one of the most heated topics of 2018 as the border violence seeps into mainstream culture with films such as "Sicario 2: Day of the Soldado". President Trump campaigned on building a border wall and cracking down on illegal immigration but two years into his presidency the border wall is only partially built. U.S. Border Patrol agents are facing deadly encounters with armed cartel members and desperate refugees on a daily basis. Meanwhile, liberal media and Democrat politicians continue to criticize our country's border force and are fighting our government's ability to deport those caught entering the country illegally. The insensitivity of the ACLU lawsuit previously mentioned shows the hypocrisy of the group who is supposed to be looking out for the civil rights of Americans is taking the side of illegal immigrants and violent gang members. wtf I love MS13 now? Anonymous37110, MS-13 is absolutely funded by the Democrats. Look at "Fast and Furious" during the Obama administration, they supplied the guns to MS-13 and the Mexican cartel !! The Democrats fund anyone who is willing to kill American citizens and take down America. Anyone who vote Democrat is not a true American!